BJP president Amit Shah on Saturday accused the Congress of doing ‘Ilu Ilu’ with terrorists, in an apparent reference to a popular Bollywood love song from the nineties. In the song, ‘Ilu Ilu’ is an acronym for I love you. “Rahul baba’s guru Sam Pitroda said do not bomb (Pakistan) but negotiate… Rahul baba if your party wants to do ‘Ilu Ilu’ with terrorists you can do that. 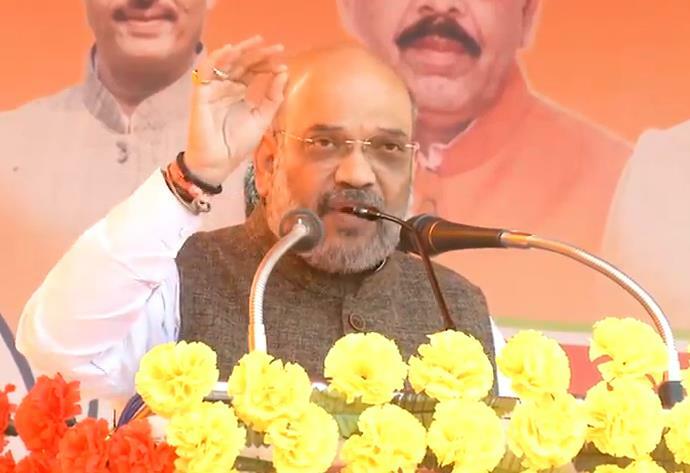 But our intention is clear, if a shot is fired, we will reply with a bomb,” Shah said here, addressing an election meeting in support of BJP’s Badaun candidate Sanghmitra Maurya. Shah claimed that during the Congress’s 10-year tenure, no action was taken even when terrorists took away heads of Indian soldiers. “This time it was the Narendra Modi government and not ‘mauni baba’ Manmohan Singh… within 13 days of the attack, the Indian Air Force went into Pakistan, bombed the terror camps and returned,” the BJP president said, referring to the Pulwama attack. Training his guns at the opposition’s ‘mahagathbandhan’, Shah said the country would have a new prime minister everyday of the week if the grand alliance comes to power. “On one side is the BJP led by Narendra Modi which is working for the country. On the other side is the ‘mahagatbandhan’ of Rahul Baba, ‘behan’ (sister) Mayawati, ‘bhatija’ (nephew) Akhilesh, Congress and others… I ask who is your (opposition’s) leader… it is clear that Modi is our leader and will be the PM, but who is your leader… no one is telling but I will tell,” he said. “On Monday it will be Mamata Banerjee, on Tuesday it will be Mayawati, on Wednesday it will be Chandrababu Naidu, on Thursday it will be Deve Gowda, on Friday… on Saturday it will be Mulayam Singh Yadav,” he added. “Can any government be run like this? Who will look after the security of the country? Can this ‘gathbandhan’ look after the security of the country?” the BJP president asked. Shah claimed people across India were chanting Modi’s name and they had decided to make him the prime minister once again. He exhorted the electorate of Badaun, from where the Samajwadi Party’s Dharmendra Yadav had won in the 2014 Lok Sabha election, to join the development journey by voting for Maurya.